Review: NIGHT TRAP 25TH ANNIVERSARY EDITION - This Stuff Is Your History! As a game collector and historian, there are very few games whose history intrigues me as much as NIGHT TRAP! Originally released in 1992 on the Sega CD, Mega CD for our wonderful world-wide audience, NIGHT TRAP would only receive mixed reviews from critics. Then, a Senate Sub Committee hearing on video game violence would forever change NIGHT TRAP'S history and the history of gaming. Now, 25 years after its original debut, NIGHT TRAP has received an updated rerelease on PS4 and Steam with an Xbox One version to follow soon! Teenagers have been disappearing from a local winery estate owned by the Martin family. With local police coming up with no leads, the Special Control Attack Team (S.C.A.T.) is called in to figure out what is going on. Splicing in to the winery’s security system reveals that all the teenagers are being caught in the estates intricate trap systems. Learning of another group of teenagers heading to the winery, S.C.A.T. quickly places one of their youngest operatives undercover. With the operative on the inside and complete control of the security system, S.C.A.T. hopes to bring this mystery to a quick close. 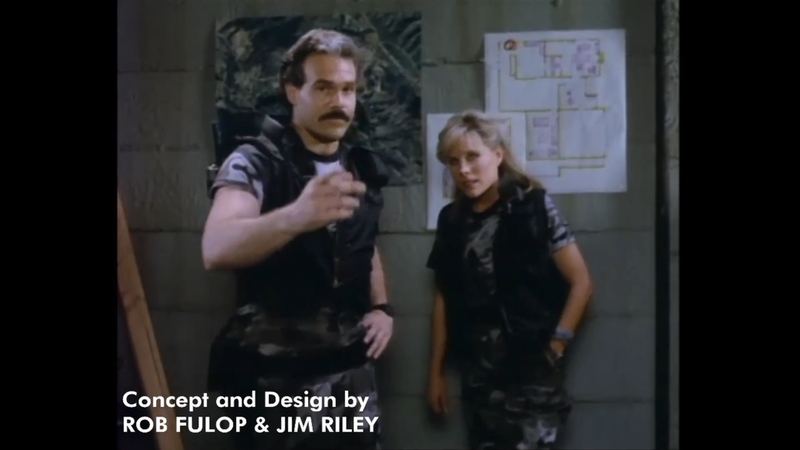 NIGHT TRAP uses full motion video to have players interact with the game world. As a special operative from S.C.A.T. it is your assignment to monitor the 8 security cameras throughout the Martin winery and use its traps to protect the girls coming to visit. Controls are simple: left click on any of the monitor thumbnails to change to that room and right click to activate a trap. As the game starts you quickly learn that the threat comes from the Augers, a vampiric enemy that need blood to survive. To capture an Auger, you need to make sure you have the proper access color to utilize the traps found in each room. An indicator light found on the UI will change from green to yellow to red when you are able to make a capture. As time progresses, the Martins start to realize something may be wrong with their security and will start to change the access color. Always try to listen in on the Martins conversations to catch when these code changes occur otherwise the girls are left defenseless. If too many Augers are left free or one of the girls dies you are given a game over. On your screen, you have a security monitor with footage from the currently selected camera. Directly below this footage are 2 rows of 4 thumbnails, each representing a different room of the Martin winery. To the right of these are a timer of your current game time, trap activation meter, and security code. For the remaster, a new UI was built to maximize video size on the main screen with the thumbnails showing video previews of what is happening in each of the 8 rooms. For Night trap purists or newcomers looking to make the experience harder, the video previews can be turned off in the options menu. As a nice bonus, the UI from each of the games prior releases has also been included to let players experience how the game originally looked! Well, almost… video quality is much better in this release. I am happy with the video quality found in this release. Using the original timed master footage shot in 1987, we are finally able to see every detail of a scene that could not be included in the original release. While not HD, it is still such a wonderful upgrade over the limited color and frame rate of the Sega CD, that it may as well be! Each full playthrough of NIGHT TRAP only takes around 30 to 40 minutes, and yes, you will do quite a few. Multiple scenes occur in different rooms at the same time and players will need to switch from these scenes to catch Augers. Thankfully, if you start a scene and complete the game you can go back and watch that scene in its entirety from the main menu. Art gallery unlocks also occur by allowing certain things to happen during gameplay. Finally, completing a perfect game unlocks the bonus game called SCENE OF THE CRIME which was originally a tech demo presented to Hasbro that paved the way for NIGHT TRAP to exist. If that wasn’t enough unlocks, there are also many different achievements that rely on completing the game with each version of the UI and catching a certain number of Augers. A new survival mode has also been added to see how many Augers a player can catch. Honestly the only issue I have with this release of NIGHT TRAP is that audio in certain scenes is mixed awkwardly. Music can over power a character’s voice or sound like it is coming from the wrong side of the room. Even though I was always interested in the history of NIGHT TRAP, this release is the first time I have ever played the game. What I found was a cheesy 80’s B-movie take on horror with laughable acting and silly enemies. The thing is, I absolutely loved it! Sure, its campy or cheesy but it’s so fun to set off a trap and watch the Augers fall into them. I also love how much bonus content was put into the game. On top of the unlockable galleries I noted above, an original interview from 1995 and a new interview from this year are also included to give players the deeper history of NIGHT TRAP and the scandal that surrounded it back in 1993. Between the great update to the original game and all of the bonus content, $14.99 is a freaking steal for this piece of history! I would like to give a special shout out to Tyler Hogle of Screaming Villains, developer of NIGHT TRAP 25TH ANNIVERSARY EDITION. From all of us here at GameTyrant, congratulations on the new addition to your family!